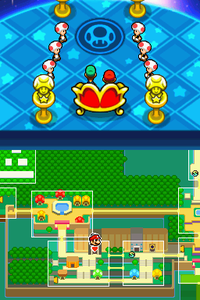 The Star Shop is one of three equipment stores located in Mall in Mario & Luigi: Bowser's Inside Story. Aside from its main function as a store, it also offers complimentary Royal Mushroom Tea, massages, and mustache shaves, the latter which Mario hastily denies. The Mario Bros. can shop here once they have achieved the Star Rank. Otherwise, the Toads at the entrance will stop the elevator and politely ask Mario and Luigi to leave. A-OK Wear 20,000 coins Increases HP by 30, SP by 10, power by 20, defense by 150, speed by 20, and stache by 20. Prevents negative status effects. Gumption Socks 10,000 coins Revives an incapacitated wearer after one turn. DX POW Gloves 15,000 coins Increases power by 20%. DX POW Boots 20,000 coins Increases power by 20%. Tight Belt 10,000 coins Decreases SP consumption by 50%.